There are some amazing books out recently that question how we think about economics. 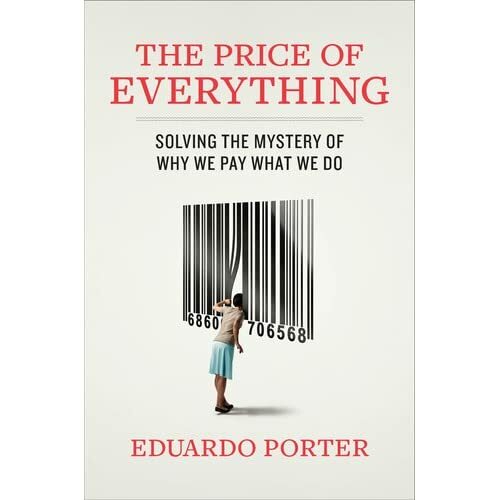 I am now into “The Price of Everything” by Eduardo Porter. I recently read the New Capitalist Manifesto by Umair Haque, which in retrospect was at the opposite end of the valuation of price chain. Umair’s book looked at price considering all costs both immediate and future. Porters book looks at price as how people interact in the here and now. How do people react to gas prices; how do people react to the availability of plastic bottles in garbage dumps in Delhi; how do people price the deaths in the World Trade Centre – yes he gets into some very controversial views on price. The price of life is a particularly powerful chapter. The overall point of the book though, is the value of everything to people as they make day to day decisions. This resonates for me for the price of banking. Consumers pay for banking two ways … interest rates and fees. Porter dissects how people make decisions about paying for things, Those decisions are both conscious and subconscious. The thinking in this is closely related to Levitt/ Dubner in Freakonomics which considers amongst other things, the result of unintended consequences from current decisions. I am only part way through the book, but already can see problems in how Banks price products versus how people value those products. People require banking / payment services just to survive and exist and banks charge what fees that people pay. The book makes the point that all decisions are based on consideration of value in the transaction. This raises the point that people pay based on the opportunity cost of the alternative to the current opportunity. In banking land there is no alternative. Each bank looks similar in terms of cost and there is no obvious alternative product/ service other than those that are quite identical aside from price. This is a problem for banks. Differentiation based on price is not a sustainable strategy. More to come as I dissect this book.